In the episode, Hana and the other Precures help out at a hospital, where they meet a mother who’s there to get a C-section, and is feeling nervous about it. She talks about how she feels like she made a lot of mistakes with her and her husband’s first daughter, and she wants to do anything right this time. Childbirth can be an especially difficult experience (to put it mildly), so it’s only natural that a mother would be anxious about it, but her expressions in the episode seem to indicate something deeper. As it turns out, Japan has one of the lowest C-section rates in the world (about 10-20%), reflecting a culture that believes that “natural births” are inherently better. Most hospitals in Japan apparently do not even give epidurals to deal with pain, under the belief that the pain felt during labor is supposed to connect a mother to her child. The mother in Hugtto! Precure wants to correct all the mistakes she made in raising her first child, but C-sections are viewed by many in Japan as an inherent mistake. It’s a challenging position to be in, to say the least. It’s the sort of difficult story that director Satou Junichi is famous for, as seen in his work on Ojamajo Doremi. 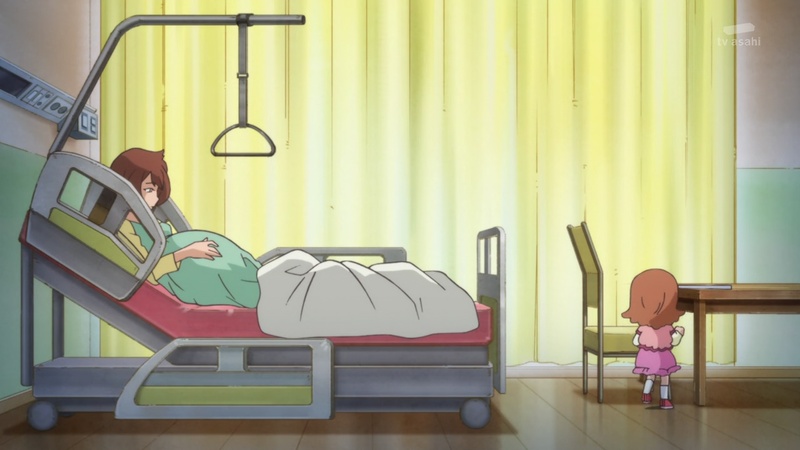 At the same time, the anime shows the doctor encouraging the use of C-sections, describing them as safe, and the mother does ultimately go through with it. By portraying the mother’s decision in a positive light, the episode reveals that it’s actually about trying to remove the negative association Japanese people have with C-sections. Moreover, Hugtto! Precure is a show that’s watched by young girls and most likely their parents, so it has the potential to educate two different generations to not look upon medical intervention during childbirth with disdain—a viewpoint that can potentially save lives. This entry was posted in anime, mahou shoujo, pretty cure, trends and tagged c-section, caesarean section, childbirth in japan, hugtto precure. Bookmark the permalink.